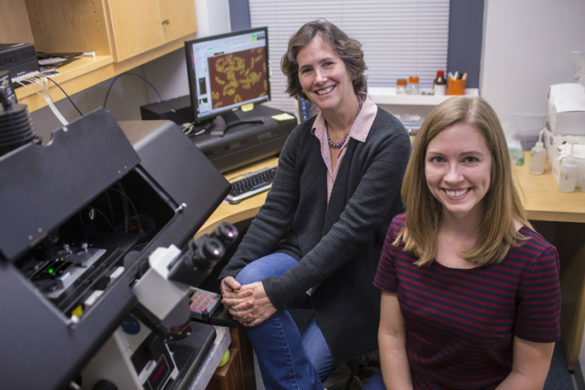 For years, Kathleen Gould, Ph.D., and her colleagues have drawn models of the contractile ring — the molecular apparatus that physically divides cells — and its parts. They used genetic studies to probe how the protein parts fit together, but their models involved some educated guesses. “We drew things certain ways, but we didn’t really know,” said Gould, professor of Cell and Developmental Biology. Using super-resolution microscopy tools available in the Nikon Center of Excellence, the investigators have determined the molecular architecture of the contractile ring in the fission yeast, Schizosaccharomyces pombe. Their findings, published in the journal eLife, provide a framework for understanding how the contractile ring forms and functions in cell division — a process that is essential for life. The contractile ring apparatus is tightly linked to the cell membrane and uses myosin motor proteins to constrict an F-actin ring (actin is a filament protein that also forms the cell’s cytoskeleton). By studying yeast, a simplified system, Gould’s team and others have been able to define a complete “parts list” of the protein components in the contractile ring. These proteins are similar to those found in the contractile rings of mammalian cells. But functional studies of how the ring components split a cell in two have been limited by an incomplete understanding of the ring’s organization and how it forms, said Gould, Louise B. McGavock Professor. “We want to understand how all these parts interact with one another and how they’re regulated,” she said. Conventional fluorescence microscopy did not allow investigators to “see” the location of ring components. Super-resolution microscopy has made it possible. Nathan McDonald, Ph.D., who was a graduate student in the laboratory, led studies to map the locations of 29 different contractile ring proteins relative to the plasma membrane. The investigators used a Nikon STORM microscope and a technique called fluorescence photoactivation localization microscopy (fPALM). The paper is the first to result from data acquired using STORM imaging resources at Vanderbilt, said Matthew Tyska, Ph.D., scientific director of the Cell Imaging Shared Resource (CISR), which includes the Nikon Center of Excellence. The researchers found that the contractile ring is composed of three layers of protein components. The layer closest to the membrane includes membrane-binding scaffold proteins, formin and the tail of the motor protein myosin-II. An intermediate layer contains signaling proteins that influence cell division. The third layer, farthest from the membrane, consists of F-actin, a major F-actin crosslinker and the motor domains of myosin proteins. Some proteins close to the membrane form clusters, while others that are farther from the membrane are uniformly distributed in the ring. The investigators used double-labeling techniques and FRET analysis (fluorescence resonance energy transfer) to support the locations of proteins within the three layers. The findings confirmed some expectations and contained a few surprises, Gould said. Formin, a protein that builds actin filaments, is located at the membrane, whereas the actin is farthest from the membrane, suggesting that the actin filaments are moved away from the membrane by myosin motors. Now that the investigators have a clearer picture of the ring’s molecular architecture, they’re also interested in understanding how it maintains its dimensions. They are using super-resolution microscopy to study the localization of ring components when one or more have been mutated. Failures in cytokinesis (the physical division mediated by the contractile ring) give rise to a “tetraploid intermediate” — a cell that has the potential to become cancerous. “This is a very risky state for a cell,” Gould said. The data will also add to the efforts of other investigators who have developed mathematical models of contractile ring formation and constriction. Abigail Lind, Ph.D., contributed to the bioinformatics analysis of the imaging data. The research was supported by grants from the National Institutes of Health (GM101035) and the American Heart Association.